Ataribox (officially "Project Ataribox") is an upcoming home video game console produced by Atari, SA. The system was first revealed in June 2017. It is expected to be released in Q2 2018. While principally designed to play games from the Atari 2600 via emulation, the Ataribox is also expected to offer a Linux operating environment that will allow users to install other compatible games onto it. Atari had exited the hardware business around 1996, following its release of the Atari Jaguar, and since then, has existed in various forms, holding the rights to the intellectual property of the Atari brand and software properties. Atari did provide licensing for the various Atari Flashback dedicated consoles but was not directly involved in their production. The concept of Ataribox came from Feargal Mac Conuladh, who joined Atari and became general manager to oversee the Ataribox release. Conuladh said that he was inspired to create the unit after seeing players connect laptops to televisions to play games on the larger screen that were not traditionally available for consoles, as well as then using social media platforms outside of the games via the laptop to communicate with friends. He also saw that Atari's game catalog had a good amount of brand recognition. His goal with the design of the unit was to provide nostalgia for the old Atari consoles, while also providing a means for players to enjoy indie games without the need for a personal computer. Processor maker AMD showed strong support for the idea and partnered to help provide custom componentry for it. While Atari made most of the decisions on the unit's hardware, they have also kept open to suggestions from Atari fans on the unit's aesthetics and other visual features. The console in its current rendition would function as a sort of hybrid between a home game console and a gaming PC, two branches of electronics Atari has operated in previously. Conuladh took lessons learned from the commercial failure of the Ouya, a similar crowd-funded microconsole. One was to use the Linux operating system directly, rather than through the limited version offered through Android, as to be able to provide more capabilities and a more open system to developers and users. Conuladh did not want to restrict what users could install on the device; while the unit's operating system will have a storefront feature, he wanted users to be able to add software by any means possible. Conuladh also wanted to steer away from problems encountered by Valve's Steam Machines, which provided a minimum set of specifications for hardware that Valve expected other vendors to built towards, but ultimately never took off. Instead, the Ataribox hardware configuration will remain fixed, controlled by Atari. Atari first teased the Ataribox in June 2017 during E3, releasing images of the box but did not call out any technical specifications. As this followed Nintendo's release of the NES Classic Edition, a dedicated console that supported a number of pre-loaded Nintendo Entertainment System games, journalists believed that the AtariBox was developed in kind, to provide a way to play classic Atari games on a dedicated platform. Further information released in September 2017 provided more technical specifications, details on the software approach including the plans to use Linux and provide an open platform for other compatible software to be installed, and a planned release in the second quarter of 2018. The price is expected to fall between $249 and $299, based on configuration options. The announcement also stated some of the funding for the unit will come from a planned Indiegogo crowdfunding campaign to be launched before the end of 2017. Conuladh said they chose Indiegogo to help with international sales and hardware support, including a close relationship with Arrow Electronics, an electronics components company, that has supported past Indiegogo projects. Preorders for the system were expected to start on December 14, 2017, but Atari announced a temporary delay that day, stating " it is taking more time to create the platform and ecosystem the Atari community deserves". Atari has not released the exact specifications of the AtariBox, but states that it will be based on a customized AMD central processor and will use Radeon graphic processing technology. Pictures of the unit released in July 2017 showed HDMI and USB ports, an Ethernet port, and an SD card slot. The unit's photos the look-and-feel of the Atari 2600, with a black veneer and faux wood-grain front plate, though sized about half as small. Conuladh says that they anticipate the hardware is comparable to a mid-range personal computer for 2017, powerful enough to run most games but not for more recent AAA titles. At least one controller planned for the console's release is based on the single-button design of the Atari CX40 joystick, adding only addition inset buttons for accessing the console's menus. The Ataribox will be driven by a Linux operating system. The software is specifically designed to be open to allow users to install other Linux-compatible applications on the Ataribox alongside pre-installed games. Other applications that can be installed include streaming applications, music players, and web browsers. Atari has stated that the unit will ship with "tons of classic Atari retro games pre-loaded, and current titles from a range of studios". Conuladh stated that there will be "hundreds" of Atari games, plus a number of other retro games from other catalogs. This Source below comes from reddit. The post below is used under the fair use law. Tempest 4000 is the only new game that Atari showcased for its new "Atari VCS" console (formerly AtariBox). The problem is that the developer says he never made a version of it for their system. Llamasoft. is known for developing Tempest 2000 for the Atari Jaguar, Tempest 3000 for the NUON, TxK for PS Vita (which caused legal troubles with Atari S.A.), and Polybus (PS VR/Oculus), which is used in this NIN music video. Atari, S.A. is the current rights holder to Tempest. While Llamasoft is developing Tempest 4000, Atari, S.A. is publishing it. Last Wednesday, on May 30th, Atari, S.A. launched their crowdfunding campaign for the new Atari VCS console on Indiegogo. They have thus far raised in excess of $2.7 million. On their official YouTube channel and on their Indiegogo page, Atari, S.A. released this video of the new Atari VCS playing Tempest 4000 in what they call a "modern game test." The problem is that Llamasoft says it never ported the game to the platform. 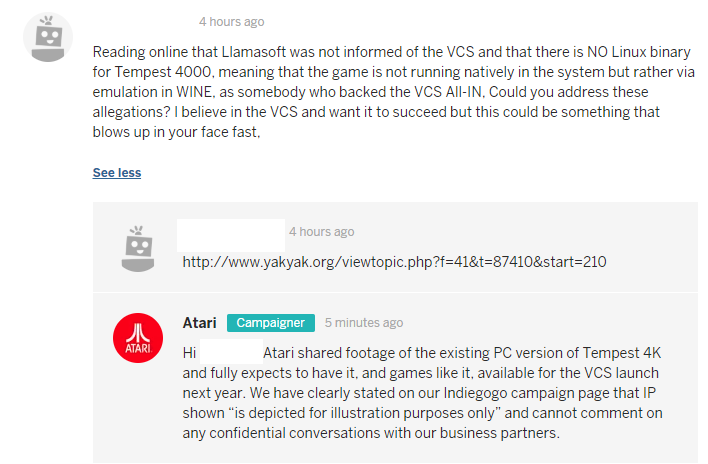 On Llamasoft's forum at yakyak.org, developer Ivan Zorzin, who goes goes by the username gilesgoat, seems to have been surprised that Tempest 4000 is being shown off for the new Atari VCS. First, he states he wasn't contracted to make a version for the Atari VCS. And he doesn't know anything about his game being on the platform. .. I know absolutely NOTHING about it, nor about it running, even less about the Atari box itself. Zorzin does not even have any inside information on the project, and knows as much as we do through media reports and press releases. I don't even know what HW or OS it REALLY is .. I mean "I know as much as you know" like "they say it's like a laptop running some Linux". Zorzin goes on to detail that the PC and PS4 versions of Tempest 4000 are done, and that the Xbox One version is awaiting certification, and he specifies frustrations he's had working with Microsoft and the Xbox One platform. In regards to the Atari VCS version of Tempest 4000, Zorzin has specific advice for his fans. "I'll believe it when I'll see it" that's my "best advice" for everyone. And this is really the best advice coming from "N years of real life experience" .. see what you have in hands when you have it in your hands, don't be afraid/worried of this or that "it's not there until you don't have it". There are two possible conclusions to draw from this. It could be that the Atari VCS demo was running Wine software, and the video shown is the PC version. I never tested it on Wine I don't know if anyone ever did, it could be, it could not be, it's not a "super demanding" graphical thing so it may work but I don't know. So, this hypothesis is plausible. Another hypothesis is that Atari, S.A. straight up pulled a Mike Kennedy and faked the footage. Kennedy was a prominent figure in the retro gaming scene and was the publisher of RETRO, a retro gaming magazine. Kennedy fell from favor when his "Retro VGS" console, later renamed to "Coleco Chameleon," proved to be fake. 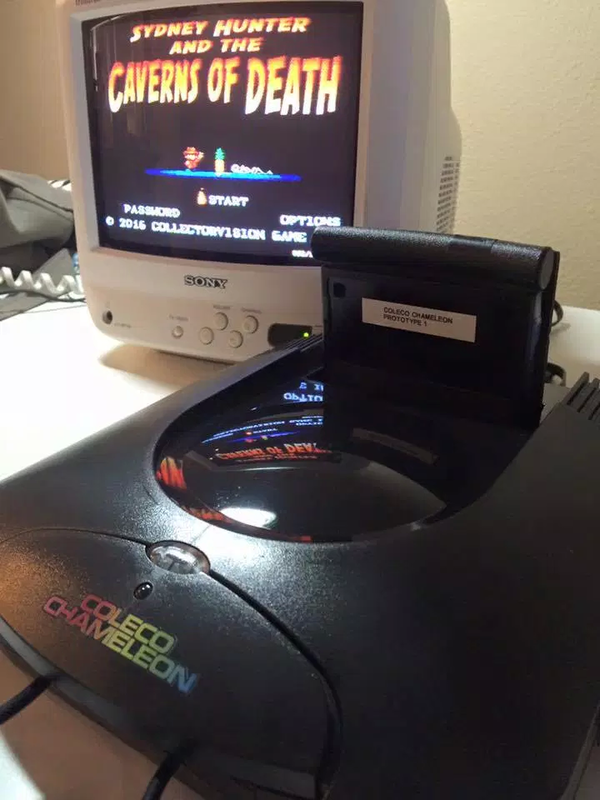 The prototype shown at the 2016 New York Toy Fair proved to be an SNES in a Jaguar shell. He was later busted again for putting a capture card in a clear shell and saying it was the actual hardware. Both hypotheses are equally possible. In either case, Atari, S.A. has not shown a game running on native hardware. Anyone considering backing this project with their own money should exercise caution. Update: AtariAge forum members have shown that the "Yar's Revenge" footage is also fake. Update: This one is courtesy of u/raneman25. They admit the game isn't running on their platform. "Get #AtariVCS at AtariVCS.com Still excited about seeing Tempest 4000 on the Atari VCS? How about some actual gameplay? We’ve snagged more behind the scenes test video! It's Tempest 4000, played with a modern controller on an Atari VCS test platform!"